Does anybody know how to enable parallel process in data extraction? I need to extract COPA data from SAP ECC 6.0 to SAP BW 7.0 and I want the data to be extracted in parallel. It is my knowledge that in SAP BW 7.0 I cannot set it via menu bar (please see below screen cap). So I looked around and found info about RSBATCH TCode. I set the LOAD_NEWDS process type to have 10 parallel processes. This created an entry in RSBATCHPARALLEL table (please see below screen cap). But when I run the infopackage the there's only 1 job created. 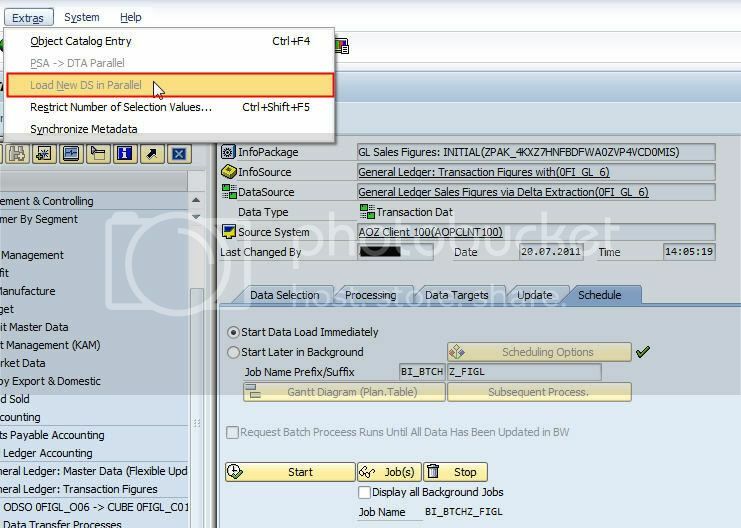 The LOAD_NEWDS process type is in the first table which makes it â€œLoadable using BI Background Managementâ€ which does not indicate serial or parallel mode capability. It is also in the second table of special features, this one specifically for loading in parallel mode â€¦ unfortunately the description seems to limit the parallel feature to the "loading from files" (as in flat files from the application server) which makes the feature dependent upon the type of source system. Some good news ... the Parallel Extraction feature is continuing to be developed by SAP. Unfortunately this does not say anything about enhancements in the Source System extractors.